It’s time for CleanTechnica‘s quarterly electricity report, which now includes both a capacity report and a generation report (we used to publish these separately). The grid continues to get cleaner and cleaner. Renewable energy accounts for a large percentage of new electricity generation capacity quarter after quarter in the United States, while old coal power plants close down quarter after quarter. However, due to the massive size of the electricity generation fleet and how long most power plants stay in operation, you could say that we are seeing only incremental improvement when it comes to electricity generation. A trend toward cleaner electricity is very clear, but it could also be portrayed as treacherously slow. Renewable energy accounted for 43% of new US electricity generation capacity in the first half (H1) of 2016, and 29% of new capacity in the second quarter (Q2) of 2016. Natural gas accounted for 57% of new US electricity generation capacity in H1 2016, and 71% of new capacity in Q2 2016. Coal electricity generation capacity actually declined by 15 GW from the end of Q2 2015 to the end of Q2 2016, due to the retirement of numerous coal power plants and no new coal power plants. Renewables now account for 19% of all US electricity generation capacity. Renewable electricity generation jumped from 14% of US electricity in H1 of 2015 to 17% of US electricity in H1 of 2016. Coal electricity generation dropped from 34% of US electricity generation in H1 2015 to 28% of US electricity generation in H1 2016. Natural gas was the leading contributor to new US electricity generation capacity in Q2 2016 and H1 2016, but renewable energy was close behind. Overall, natural gas accounted for 71% of new capacity in Q2 and 57% of new capacity in H1, according to data from the US Federal Energy Regulatory Commission (FERC) and non-utility-scale solar (“other solar”) estimates from CleanTechnica — estimates that are based on several factors and proved to be extremely accurate in Q1 2016. Renewables totalled 29% of new capacity in Q2 and 43% of new capacity in H1 2016. In terms of total generation capacity: coal capacity dropped 15.1 GW from the end of Q2 2015 to the end of Q2 2016, natural gas capacity grew by 10.6 GW, solar capacity grew by 8.1 GW, and renewable energy capacity as a whole grew by 16.3 GW. Overall, US electricity generation capacity net growth was 10.6 GW. Due to coal power plant retirements and the mix of new power plants across the grid, renewable energy has risen to 19.2% of all US electricity generation capacity, up from 18% at the same time last year. 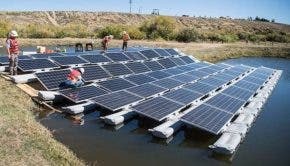 Electricity generated in the USA from renewable energy sources in the first half of 2016 jumped up to 16.9% of total US electricity generation, compared to 14.3% in the first half of 2015, according to data from the US Energy Information Administration (which includes estimates for non-utility-scale/rooftop solar electricity). From Q2 2015 to Q2 2016, the renewable electricity jump was from 14.5% to 16.6%. 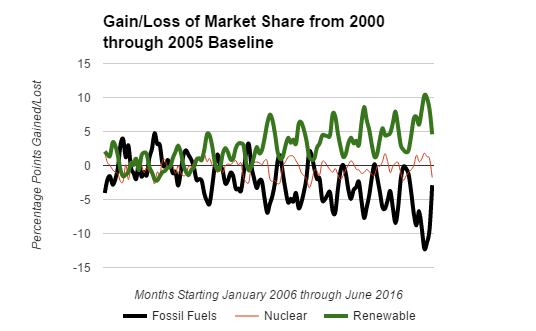 The following graph and chart by CleanTechnica community manager Bob Wallace better highlight changes in electricity generation market share in the United States in recent years and coal’s clear decline. If we see them same amount of change in renewable energy market share in the coming year, capacity will grow from 19.2% to 20.4% of total installed power capacity, and electricity generation will grow from 16.9% to 19.5% of US electricity generation. 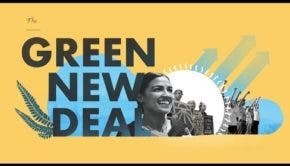 Naturally, this would depend on a variety of difficult-to-predict factors, such as natural gas power plant growth, hydro and wind resource availability, solar power growth, wind power growth, coal power plant closures, etc. You can suggest ways to more quickly grow renewable energy market share in the coming year in the comments below. We will write a follow-up article based on these suggestions so that Q2 2017’s report is a bit more uplifting. 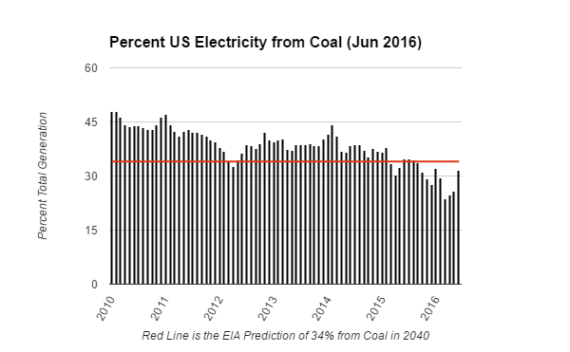 Did CleanTechnica Push The US EIA To Include Distributed Solar Generation In Monthly Reports?